Before I give you 7 reasons to have a wellbeing program let me start by saying that I am very skeptical of many of the claims being made in the wellbeing industry. That’s why the information I’m going to share here is backed by decades of solid research. Don’t worry, this is not a graduate school discourse on the science of wellbeing but it is a brief overview of why having a wellbeing program can provide great benefits to any organization. wellbeing programs are more popular than ever. They started out as employee perks for large corporations; in fact, they used to be called corporate fitness programs. Today wellbeing programs are common among both medium and small-sized businesses. Wellbeing programs are now regularly part of a company benefits package. When done correctly, wellbeing programs give employees incentives, tools, social support, privacy, and strategies to adopt and maintain healthy behaviors. Most worksites do a pretty good job of helping employees improve health behaviors. In fact, I would go so far as to say that worksites, both private and public, are the chronic disease prevention centers of the United States. Worksites are doing more to prevent, arrest, and even reverse chronic diseases than any other group. Hospitals are great at treating disease and they are good at early detection of disease, but they don’t do much in the way of disease prevention. The total reach and impact of worksite wellbeing programs dwarfs all other efforts to improve the health of adults. I don’t know of any worksite that actively sought for the role of being disease prevention experts. Employers have been thrust into this position. They really don’t want to do it. They would prefer to make and sell products, provide services, deliver the goods and services that they are designed to produce. Yet worksites are doing more disease prevention and wellbeing than any other entity in society today. They are more consistent about it and they are more effective than anybody else. And they do all this because they enjoy the benefits that come from having an active healthy workforce. Worksites all across the world are implementing employee wellbeing programs because they like the benefits of wellbeing. Think of the different benefits employers typically offer. These could include a retirement or pension plan, healthcare, paid time off, or maternity leave. These are designed to help your organization recruit and maintain qualified employees. Yet there is not a single published study that shows that offering these benefits as any measurable effect on it worksite’s ability to recruit or maintain workers. We do them because we believe they are important. Now consider your wellbeing program. Unlike all the other benefits your worksite offers, wellbeing programs have been studied for decades. There are hundreds and hundreds of rigorous scientific evaluations of the impact of wellbeing programs. There is more research on the impact of wellbeing programs than anything else your company does. Granted, the research is not perfect—no research ever is. But after decades of scientists evaluating programs, we have an enormous amount of very solid data that show the benefits of having a wellbeing program. I personally have published 75 research papers on the impact of worksite wellbeing programs. And I am just one of hundreds of scientists in the field. This research is what I will use to back up the 7 most popular reasons to have a wellbeing program. The core of every good wellbeing program is behavior change. With the right education, skills, motivation, skills/tools, and social support, people change behaviors. Wellbeing programs are good at helping people adopt and maintain healthy behaviors. This is perhaps the biggest benefit of having a wellbeing program. Many studies have evaluated the ability of wellbeing programs to improve health behaviors. Not every wellbeing program is able to show positive results. The ones that are well-organized and follow effective behavior change models show the best results. Here are the results of an evaluation I published recently. 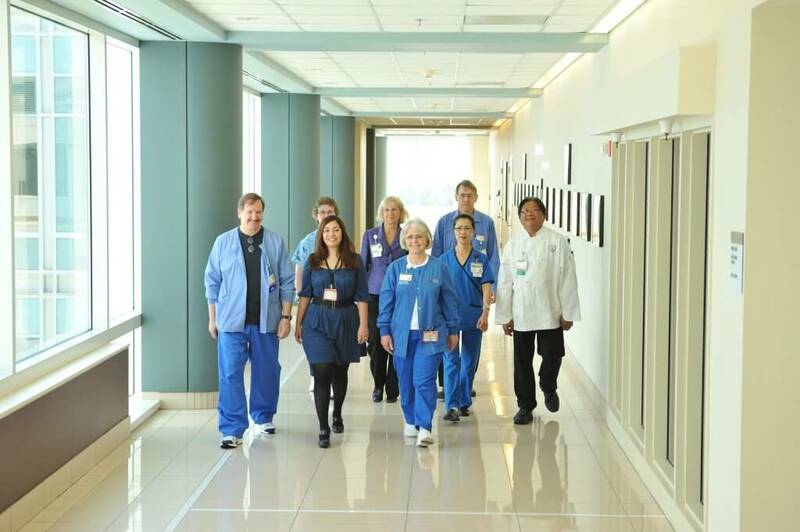 The 1,800 employees at this worksite reported their health behaviors at baseline, one year, and two years after the program began. I like studies that go out for two years because the results are pretty conclusive by that time. 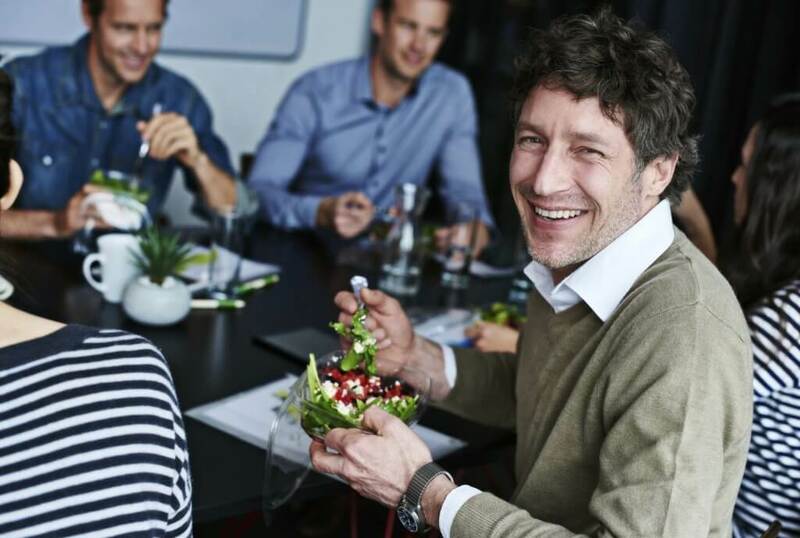 If you can get your employees to participate in a good wellbeing program chances are they will adopt and maintain healthy behaviors for years to come. Most wellbeing studies show the employees have better health behaviors. They eat healthier foods, they eat smaller portions, they exercise more often, they smoke less, they don’t drink in excess, they wear seat belts more often, and they’re pretty good at controlling their stress. Wellbeing programs can also help alleviate depression and the symptoms of depression as well as improve life satisfaction. Even the American Heart Association has completed an extensive review of the ability of wellbeing programs to improve health and reduce cardiovascular risk. We find that workplace wellbeing programs can help contain the current epidemic of lifestyle-related diseases, the main driver of premature morbidity and mortality as well as health care cost in the United States. The foundation of any good wellbeing program must be focused on helping employees adopt healthy behaviors. Elevated blood glucose, high blood cholesterol, and high blood pressure are almost all caused by unhealthy diets and lack of physical activity. Eating and exercising are behaviors. A few years ago I published the results of a randomized clinical trial that helped people improve their nutrition and physical activity. Low health risks are the foundation of good health, and wellbeing programs are a great way to help employees and their spouses avoid elevated health risks. 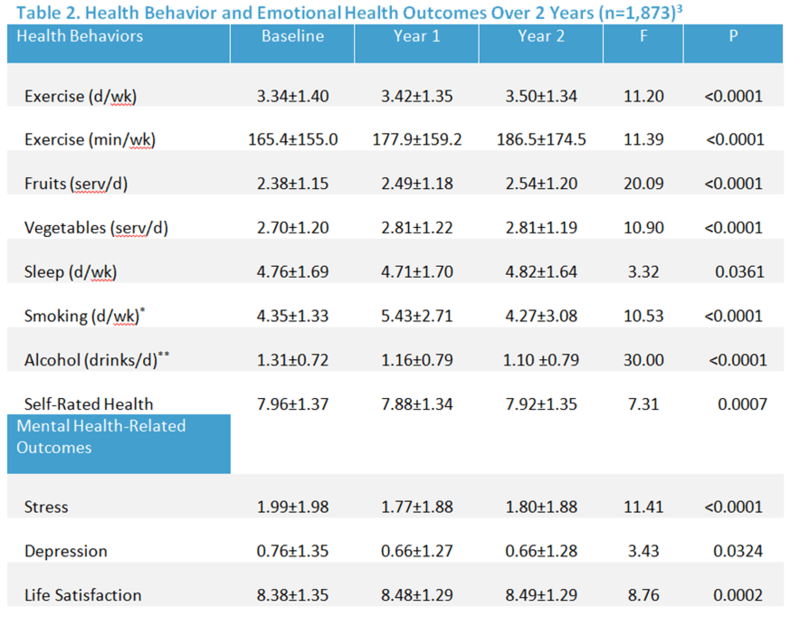 There are hundreds of research papers that evaluated the ability of wellbeing programs to reduce elevated health risks. 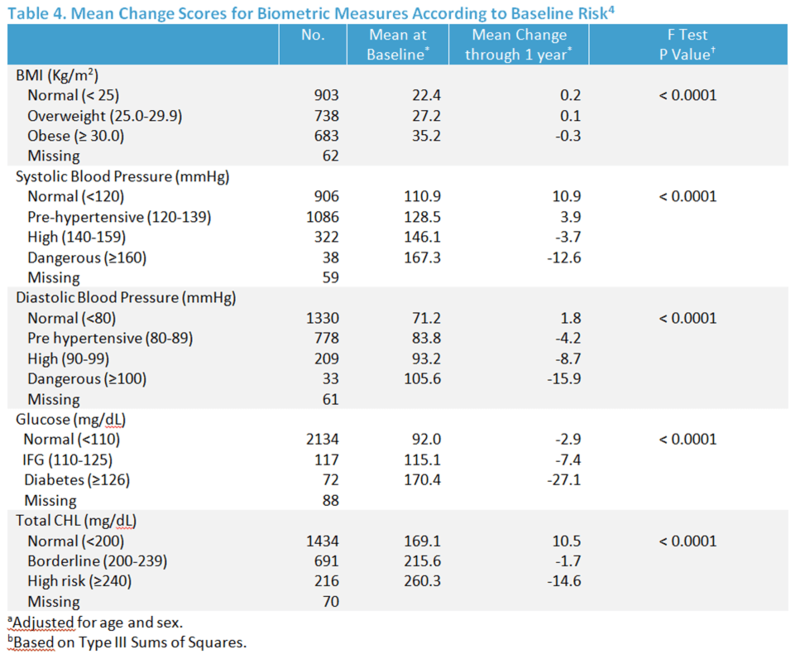 One particular study looking at almost 200,000 wellbeing participants and showed that 5 0f 7 health risks improved after one year. Another researcher looked at all of the published studies to get a consensus. This review showed that comprehensive wellbeing programs will have a significant impact on elevated health risks. There is one weakness that almost all wellbeing programs have. After 30 years of evaluating dozens and dozens of programs it has become clear that it is difficult to impossible to get large groups of employees to reach and maintain a healthy body weight. The obesity epidemic is caused by a variety of cultural factors and helping employees lose weight has proven to be exceptionally difficult. While the research suggests that helping people improve blood cholesterol, blood pressure, and blood glucose is possible, helping people lose weight and keep the weight off has proven to be hard to do. I’m the first one to admit that worksite wellbeing programs are not very effective at helping people lose weight. If the focus of your wellbeing program is to help individuals reach and maintain a healthy body weight you should prepare yourself to be disappointed. The unhealthy culture that surrounds most of us makes it extremely difficult to lose weight, in fact, most people in the United States and in the industrialized world gain weight every year. So there’s a couple ways to look at this. Wellbeing programs are very effective at reducing elevated health risks like blood pressure, glucose, and cholesterol. But they are not very effective at helping people lose weight. Without the impact of all the wellbeing programs in the world, obesity would be even worse than it currently is. 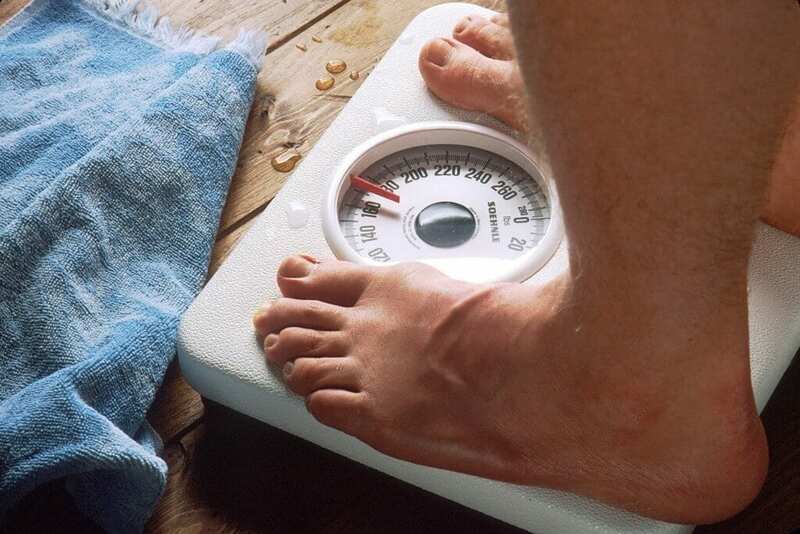 wellbeing programs may not help your employees reach a healthy body weight but it looks like they are helping your employees to stop gaining weight. There are almost 100 different studies that have looked at the financial impact of wellbeing programs. I have published six of these myself, and I have years of experience conducting some extremely complicated ROI studies. These studies are not easy to do and they take years to complete. In 2001 I published the most comprehensive review ever completed on the financial impact of worksite wellbeing programs. That study alone are reviewed 100 different research papers. The ability of a wellbeing program to reduce healthcare costs depends upon how effective the program really is. Having an occasional lunch and learn about nutrition or just doing a biometric screening will not be enough to move the healthcare cost needle. Comprehensive worksite wellbeing programs that improve employee behaviors will see a bending of the healthcare cost trend. Most often they will discover that the savings from program participation will be greater than the actual cost of the program. Almost everyone of these return on investment (ROI) studies show a positive return on investment. Researchers from Harvard recently published another summary of the wellbeing ROI research. Among the 22 different studies that looked at wellbeing programs and healthcare costs, the average return on investment was 3.27. This means that for every dollar that was spent on the program the company saved $3.27 because of reduced healthcare costs. Last year researchers evaluated the impact of the WellSteps wellbeing program at a large school district. 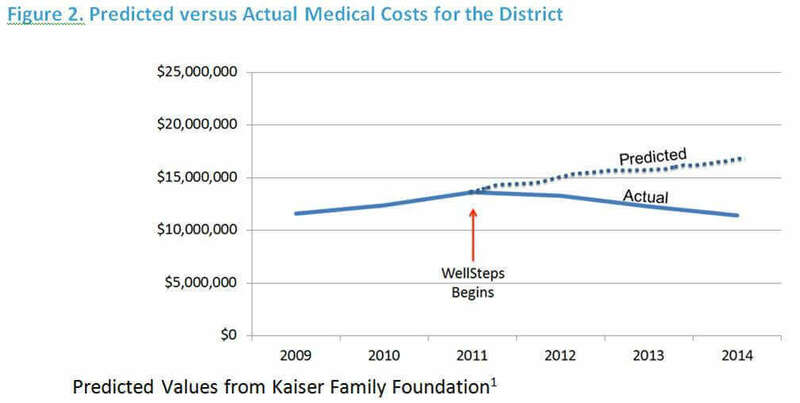 Here is the actual healthcare cost trend for this worksite. After four years of wellbeing this worksite is actually spending less on healthcare costs than it did before the program began. For every dollar they spent on wellbeing they saved $3.3. Anyone who still thinks wellbeing programs don’t improve health is choosing to completely ignore hundreds of peer-reviewed scientific research papers that say otherwise. These results confirm several ideas about the benefits of wellbeing. 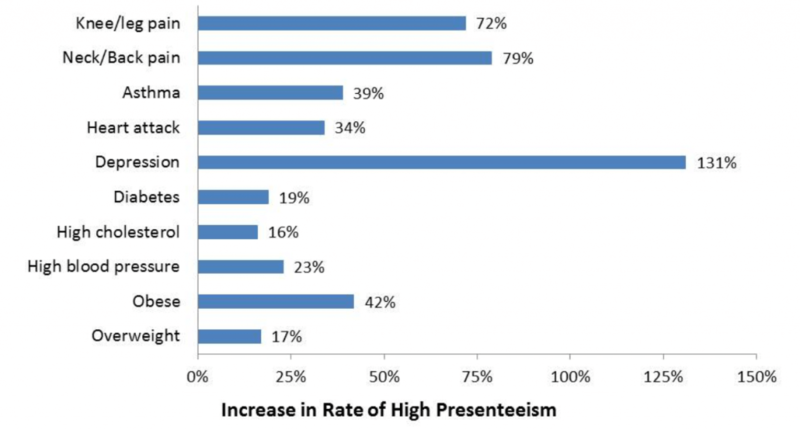 Presenteeism is associated with poor health behaviors as well as elevated health risks and the presence of chronic disease. Wellbeing programs that focus on helping employees have good health behaviors will eventually have an impact on productivity. I have written extensively about the connections between worksite wellbeing and productivity in a previous blog. 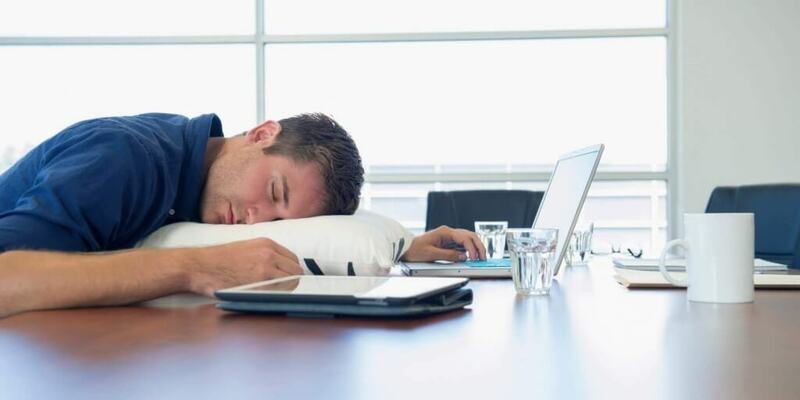 Any wellbeing program that can reduce absenteeism will experience cost savings. Harvard researchers looked at the ROI of wellbeing programs as they relate absenteeism and demonstrated that for every dollar wellbeing programs spend on wellbeing they can save $2.73 and reduce absenteeism. Wellbeing programs have the ability to improve employee health and this can have an impact on whether or not individuals are absent from work. But there is another reason why wellbeing programs can have such a large impact on absenteeism. Employees who have high morale are significantly less likely to be absent from work. I confess there is no published scientific data that shows that wellbeing programs will make a significant impact on your ability to recruit and retain employees. There are a lot of factors that go into the decision to accept a job offer. It helps if you can offer a good salary and a rich benefits plan. You’ll get free wellbeing, free gym membership, onsite health clinics of every variety, and NO insurance premium—doesn’t that sound great? All the large software/tech companies are offering wellbeing with their benefits plans. The do this because they are all fighting with each other to hire and retain the best workforce possible. A rich benefits package makes it easier to get the best employees. I don’t have any evidence that shows that having a wellbeing program will tip the scales when an employee is considering accepting a job. A Virgin HealthMiles/Workforce survey did find that about 87% of employees said they consider health and wellbeing offerings when choosing an employer. But compared to other defined benefits, wellbeing plans just don’t have much sway in the employment decision process. However, wellbeing programs do have a strong impact on retention. Retention is the ability a worksite has to retain its workforce. Rich benefits also have a powerful influence on retention, but a good wellbeing program can help keep employees loyal. Personnel is the most important asset in every organization. 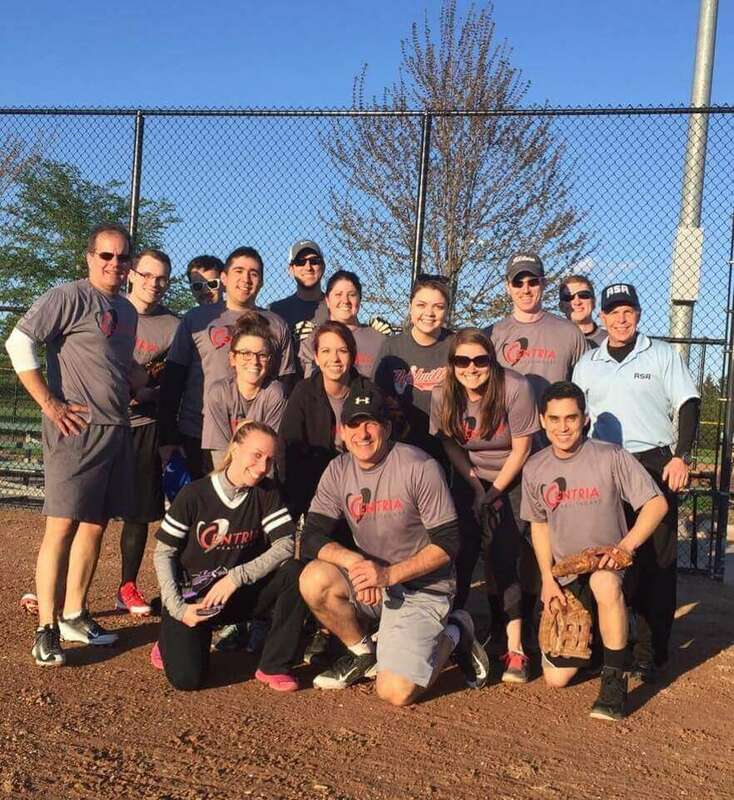 When an employer offers a wellbeing program to its employees the company is saying, “We think you are an important part of this organization and we want you to be healthy, happy, and employed here for a long time”. When you offer your employees a wellbeing program, you are showing them that you care about them. I’m going to let you in on a little secret. The WellSteps Wellbeing solutions has a performance guarantee. After three years we guarantee that your wellbeing program will have a positive return on investment. The secret is that after three years almost nobody cares about the ROI. That may have been a good reason to start their wellbeing program, but after employees start to engage, communicate with each other, feel valued and appreciated, the reasons for doing a wellbeing program change. After three years we have found that our clients like to do wellbeing because they like the way it has changed their worksite culture. 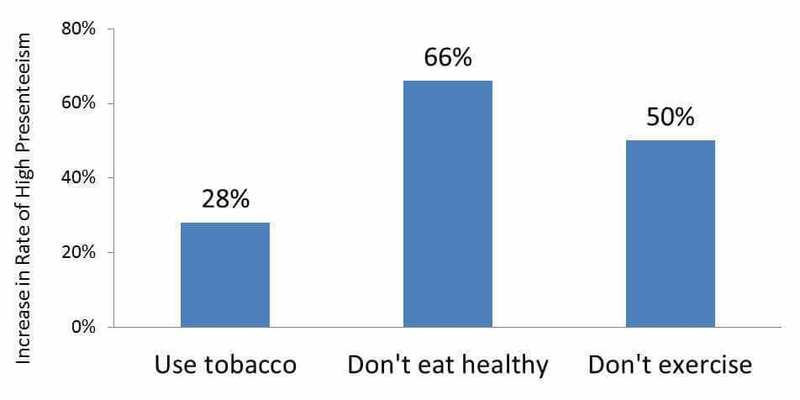 Employees are obviously healthier but more importantly they are happier. This is another reason that doesn’t have scientific research to back it up. We are probably never going to have a good study that can evaluate that question. What we do have, however, is experience with hundreds of clients that have migrated away from the ROI of wellbeing and have moved towards the value on investment (VOI) of wellbeing. I’ve blogged about this previously here. The academic approach to wellbeing programs has limitations when we start talking about employee morale. As the CEO of WellSteps, a company with dozens of employees, I see the impact of our own wellbeing program in a very different light. Employee morale is a huge factor in the success or failure of any business and a good wellbeing program helps employees be happy and healthy. When you offer your employees a wellbeing program you are telling them that you respect them, you trust them, and that you want to help them be successful in life. Employees have high employee morale when they are allowed to be creative, solve problems, feel safe and appreciated, develop self-esteem, and achieve personal goals and aspirations. Employees are happy when they have a sense of control over their lives and their health. In my opinion. this is one of the most powerful reasons to have a wellbeing program. Realistically, your employees don’t care about your healthcare cost problem, they care about their own happiness. Your employees don’t share your concerns about productivity or absenteeism. They care about having a fulfilling, enjoyable job. Your wellbeing program helps employees achieve all of their needs, both physical, social, and emotional. When it is all said and done, your employees want to feel loved and appreciated, and when they do really good things happen at work. After 30 years of researching all of the benefits of a wellbeing program, I have come to the conclusion high employee morale, while almost impossible to evaluate, is an extremely important benefit of wellbeing. Perhaps this is why many of the companies with outstanding wellbeing programs have dramatically better financial performance. There is an enormous amount of research to support the benefits of wellbeing. A comprehensive wellbeing program is going to improve employee health and improve your organization’s bottom line. It is not going to make all your problems go away, but it is going to help you create a worksite culture of health. It will boost and maintain employee morale. With an effective wellbeing program you will improve the lives of your employees and help drive the success of your organization.